America is known as a melting pot thanks to a large number of immigrants who have come here from all over the world. New York City has earned the title of being a beacon to the world thanks to places like Ellis Island and the iconic Statue of Liberty. When New York was first forming, it became the hub of progress and business, making it the ideal place for immigrants to come and start a family and a whole new life. Because the United States offers people freedom to live as they please, it’s no surprise that many immigrants wanted to live here, and they still do today. A large immigration station was constructed at Ellis Island in New York to serve as the main processing hub for those coming into the country. The first station was opened on New Year’s Day in 1892 and was a large three-story structure. Sadly, in June of 1897, the station was destroyed by a massive fire and millions of immigration records were lost. But that didn’t deter America or its immigrant population. A new station was built, and it opened in 1900, offering a new place for immigrants to come and be processed. By 1954, Ellis Island saw more than 12 million immigrants come into the United States. The iconic Statue of Liberty is positioned near the island and served as a welcoming sight to all who came near the shores of the island. Immigrants traveled by boat and came from all over the world, coping with close quarters and rough conditions. Once they arrived, they had to wait in long lines that often lasted several days until they could be officially processed and welcomed to the country. Each person was checked out by a doctor and all of their paperwork was inspected by police before they could enter. A History of Immigration in the U.S. The majority of immigrants who arrived in America through Ellis Island were from Europe. Many were Italian, Russian, Irish, and German. Five million Germans alone immigrated to the United States by the end of the 19th century. The very first immigrant to be processed through Ellis Island was a young Irish girl. Others traveled to the United States from as far away as Asia. 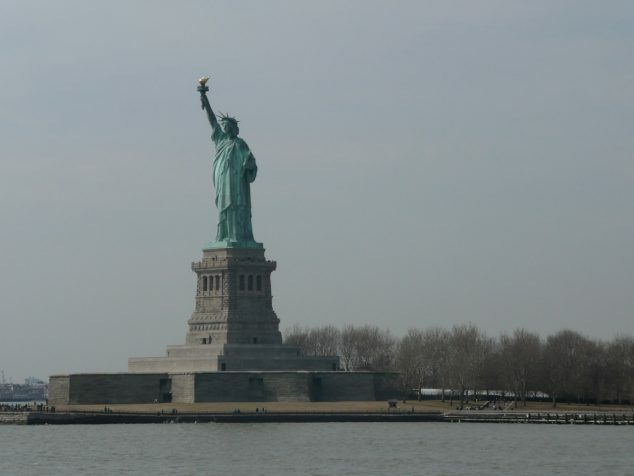 It is said that around 40 percent of all Americans today have at least one relative who arrived through Ellis Island. With all of these people coming from other countries, New York City became a very diverse place, with people from all over the world learning to live and work together. It was a mixture of cultures, languages, and skin colors, though most people separated themselves into neighborhoods based on their country of origin to help them keep their heritage and culture. This would help to create many of the neighborhoods that are still in New York City today. Originally, most immigrants found jobs in places like restaurants, hotels, and factories. But after the Industrial Revolution, America was in need of laborers. The city of New York was growing at a rapid pace, and people were needed to help construct buildings and maintain roads. In fact, the need for workers was so great during that time that the U.S. would advertise for help in European newspapers. Immigrants helped to shape and build much of New York City, including laying down cables for the street lights on Broadway, helping to build the Empire State Building, and working on bridges over the East River. The Flatiron Building was built almost entirely by immigrant workers. Most immigrants ended up working in places like clothing factories or food-making plants, which was a big change from their lives in other countries, where a lot of them worked on farms or ran small stores. But immigrants played a very important role in the shaping of what our country is today thanks to their hard work. Many immigrants came to Ellis Island with their families, while some came alone to find jobs and homes before the rest of their family arrived. Since the influx of immigrants was quite large from the late 1800s through the mid to late 1900s, the population of New York City grew really fast, and there wasn’t enough housing to keep up. Buildings called tenements were constructed, which look like the apartment buildings of today except that they were much more crowded. Often, several families would live very close together in dirty conditions. The homes of most immigrants were small, and many did not have electricity or running water. Immigrants would often work from sunrise to sunset. Today, you can still see some of the buildings that were popular places for immigrants to gather when they weren’t working. You’ll find many Irish churches in New York, such as St. James Church. The Forward Building was built in 1912 and was home to a Jewish newspaper created by immigrants. And Chinatown, an area settled by the Chinese and filled with restaurants, stores, and other businesses, is still a popular place with both residents and tourists.